Deutsche Bank has loaned Donald Trump hundreds of millions of dollars. There’s been a lot of talk about money laundering over the past several months—as it relates to Russia, the Mueller investigation, and President Trump. If, as a topic, money laundering feels a bit opaque, that’s because in many cases that’s exactly what it is designed to be: confusing and difficult to follow. Simply stated, money laundering is the process by which someone takes “dirty” money (earnings from various kinds of criminal activity) and makes it appear “clean,” or legitimate. How does money move from being dirty to legitimate? It involves three main steps: Placement (getting the money into the legitimate global financial market), Layering (hiding the original source of the money), and Integration (making said money accessible). “Follow the money” is an adage made famous during the Watergate era. It was popularized by the motion picture drama-documentary, All the President’s Men, starring Dustin Hoffman and Robert Redford. 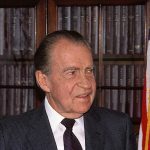 Hoffman and Redford depicted reporters Bob Woodward and Carl Bernstein, who uncovered the details of the Watergate scandal, leading to the eventual resignation of President Nixon. Criminal A from Russia has acquired $15 million in dirty money and needs to make that money seem legitimate. To do that, he needs to route the money through a legitimate financial institution. Person B contacts the London branch of the same financial institution and says, I want to sell Thing C for $15 million. Next, Criminal A walks into the Russian branch of the financial institution and says, I want to buy Thing C for $15 million in cash. The financial institution approves the transaction and wires the money from Criminal A to Person B. The money has now been injected into the legitimate financial market and has become “clean.” Bonus: Often, Person B is the same person as Criminal A, meaning that the “sale” only happened on paper and no trade was actually made. But now, Criminal A has the freedom to legitimately buy things, like tech companies, cars, yachts, or real estate. If the example above sounds familiar, that’s because it’s precisely what Deutsche Bank was busted for a few years ago in a scandal that centered on its Moscow subsidiary. Billions of dollars filtered through from Deutsche Bank’s Moscow office to its Western counterparts. 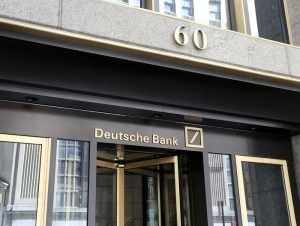 In fact, Deutsche Bank paid $425 million in fines to New York State last year, with an even heftier fine from the Justice Department expected to follow. So, what does all of this have to do with President Trump and the Mueller investigation? In December 2017, Special Counsel Robert Mueller issued a subpoena to Deutsche Bank for documents related to people or entities close to President Trump. It also turns out that during the same time the Deutsche Bank money laundering scheme was alive and well, Deutsche Bank was loaning Donald Trump hundreds of millions of dollars for real estate projects, like the $600 million Chicago Tower in 2005. By 2008, he had already defaulted on that loan, and then proceeded to counter-sue Deutsche Bank with a bogus lawsuit. Despite that, the bank continued to grow its financial relationship with now President Trump, such that he is estimated to owe them over $364,000 in outstanding debt. Is it possible that Deutsche Bank, a major international financial institution is just that bad at identifying and cutting off risky financial customers? Perhaps, but adding to the suspicion around this is the fact that since President Trump took office, the federal investigation into Deutsche Bank has reportedly gone quiet. And the individual who had been leading that investigation by the Justice Department, Preet Bharara, was fired by President Trump after he took office. The above example is just one part of why many have suspicions about the president’s personal ties to Russia and money laundering schemes. Add in Michael Cohen and Paul Manafort, and the evidence stacks up even more. By all accounts, Mueller is following the money-laundering trail. Where will it lead? Right now, it sure looks like it feeds our president, courtesy of Russia.